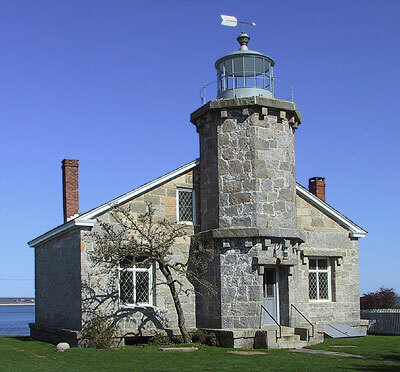 The Old Lighthouse Museum in Stonington, Connecticut is today’s “Museum of the Day”. It’s a stark departure from the recent museums that have been featured, but holds its own in terms of visitor experience and architecture. For more than 170 years, this modest stone citadel — a lighthouse tower attached to a dwelling — has stood at the entrance to the harbor of Stonington, Connecticut’s only port facing on the Atlantic. Now regarded fondly as a durable symbol of a seafaring past, in its working years it performed the valuable service of guiding ships across treacherous Fishers Island Sound. The building is notable among lighthouses of its period for its fanciful stonework, with ornamental cornices around the tower and weighty granite lintels above doorways and windows. When it was built in 1840 it had a nearly flat roof with simulated battlements, but it leaked so badly that two years later local craftsmen were called in to install the gabled roof it has today. The lighthouse remained in use from its construction in 1840, when it replaced an earlier lighthouse, until 1889, when it was supplanted by beacons on the harbor breakwaters. It had been a dank home to seven keepers and their families, and until 1909 it continued to house the keepers who tended the breakwater lights. After a new keeper’s house was built next door, the lighthouse was deserted until the U.S. Government decided to sell it, and in 1925 the Stonington Historical Society was able to acquire it for $3,650. In 1927 the Society opened it as a lighthouse museum, the nation’s first. And, except for most of World War II, the museum has been open every year since. Starting in 1962 it has been open six months a year and has attracted thousands of visitors.